When you embark on the ultimate day trip to Tulum from Cancún, you will silently thank the ancient Maya people for their genius. And no, I am actually not referring to their incredible leaps in the fields of engineering, astronomy, communication, and agriculture. Because, all unbelievable scientific achievements aside, the Maya were also experts in the field of real estate. When you make the day trip to Tulum from Cancún, you will see exactly what I’m talking about: an incredibly preserved Mayan city, sitting atop one of the most pristine, untouched, white-sand beaches on the planet. No, the Maya could not have chosen a better spot to settle. Thank you, Maya. Getting to Tulum from Cancún could not be simpler. While the one-way drive lasts about an hour and forty-five minutes, it’s a straight shot from Point A to Point B. 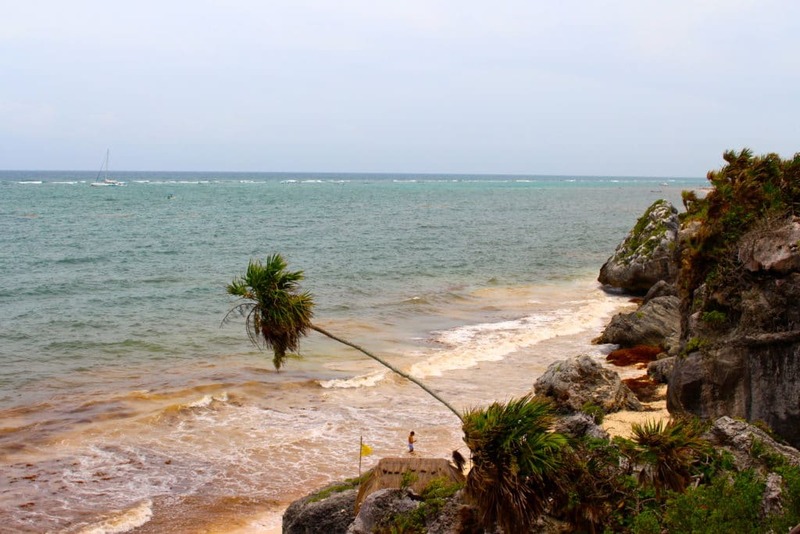 All you need to do is hop on the Mexican Federal Highway 307 and drive roughly 181 kilometers until you reach Tulum! There’s nothing more to it. Your day trip to Tulum from Cancun could not be any easier. And by the way, if you’re coming from Playa del Carmen, the same directions apply, only the drive is much shorter, at about 64 kilometers. Once we arrived at Tulum, we hopped out of our rental jeep, into the hot, humid air, our clothes immediately sticking to our bodies, our sunscreen and bug spray mixing with fresh perspiration. 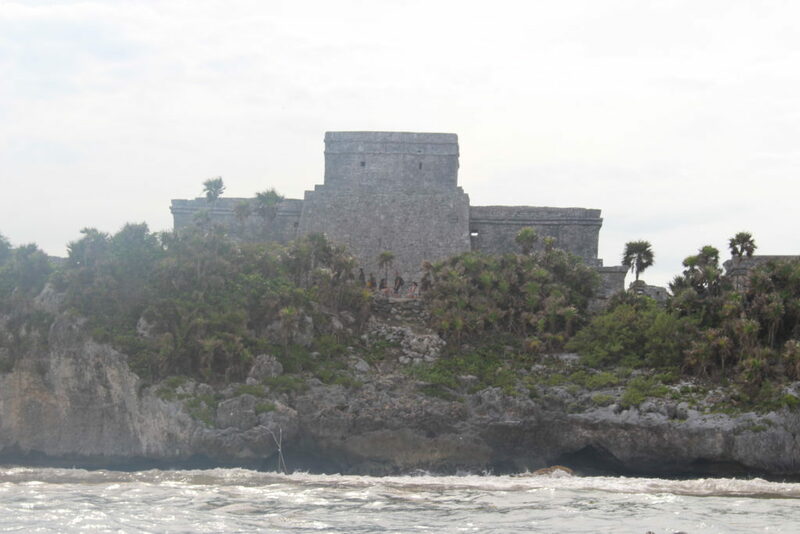 After about ten seconds of pouting to myself, I remembered that I had just arrived at the ancient Mayan ruins of Tulum! It would be worth all the bug bites, sunburns, overheating, and overall sticky feeling (though I do usually like to keep those lovely components to a minimum, if possible). Upon arrival, a park employee explained to us the three ways we could experience Tulum: on our own for as long as we desired, with a guide, or on our own, followed by a snorkeling excursion where we’d see Tulum from the ocean. Of course, we opted for the most adventurous, yet most expensive, option: exploring on land and sea. Bring on the good times! As we strolled up the dirt path toward the ruins, we swatted away thousands of bugs who attempted to eat us alive. Meanwhile, scaly creatures surrounded us, watching us with a cautious eye. 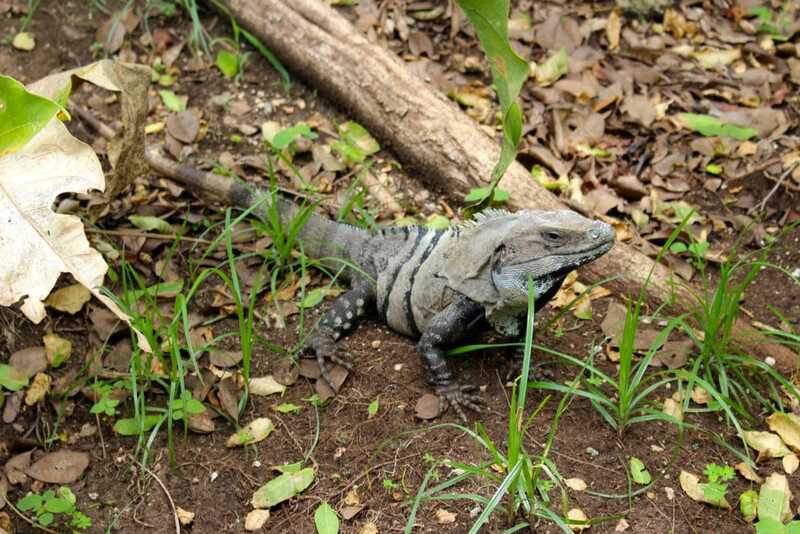 At any given moment, if we searched carefully enough, we could count at least ten iguanas camouflaged into one field of vision – these little guys were everywhere. And oh man, did we have quite a bit of fun chasing them around with our GoPro sticks. Oops! 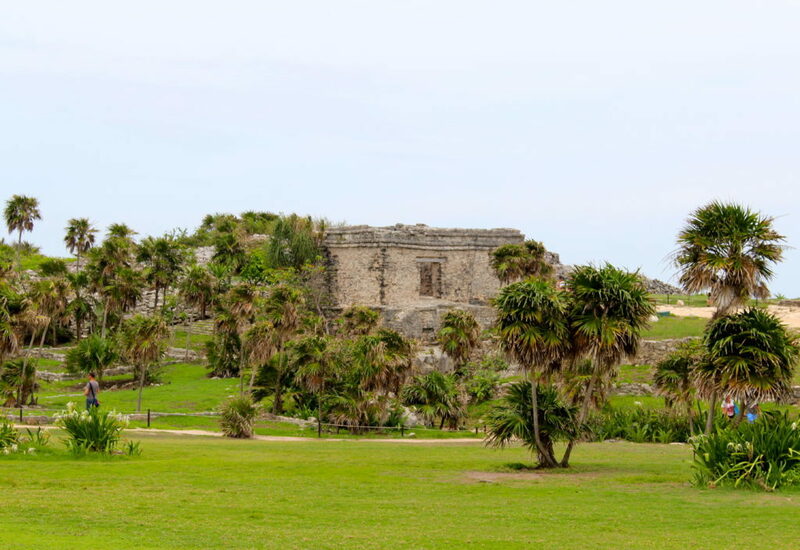 Now, first, let me just state that we’ve visited other Mayan ruin sites before in Belize and other parts of Mexico, but the Mayan ruins of Tulum were different. Perhaps it was the millions of palm trees that dotted the lush, green landscape, or perhaps it was the sheer amount of incredible ancient Mayan structures that set it apart from the others. Or could it have been the gentle sea breeze which aided us in our battle against the Yucatán heat? I don’t know. I do know, however, that Tulum is a sight worth seeing at least once in your lifetime. Can you imagine a more beautiful place to wind back the clock and imagine what life would’ve been like as an ancient Maya? On the way to Tulum, I couldn’t wait to see what all the fuss was about. 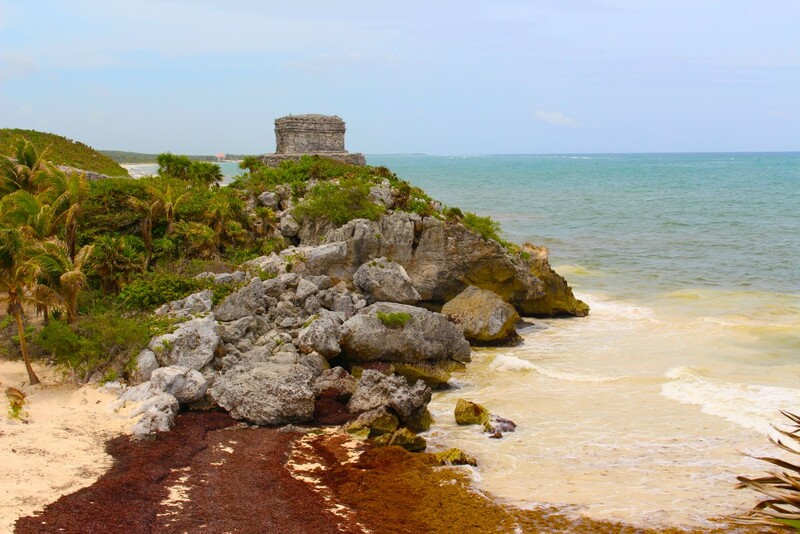 I expected to witness rugged cliffs topped with old Mayan temples, towering above white, soft sand, and beautiful turquoise water. But if there’s one thing that we all eventually learn from traveling, it’s that pretty much nothing ever goes as planned. What I expected to see is certainly not what I saw. Thanks to a recent storm in the Yucatán Peninsula, the beaches at Tulum were piled high with seaweed. So it goes without saying that this is not what I had anticipated to see, but it was stunning nevertheless. And really, how much more interesting and colorful does the seaweed make the shot look below? If you’ve snorkeled in Belize or Thailand, the snorkeling off of Tulum’s coast will completely underwhelm you. While we knew we weren’t about to snorkel the most colorful or lively reefs in the world, we were excited to take a refreshing dip in the ocean, swim with some fish, and most importantly, catch a view of the ruins by boat. 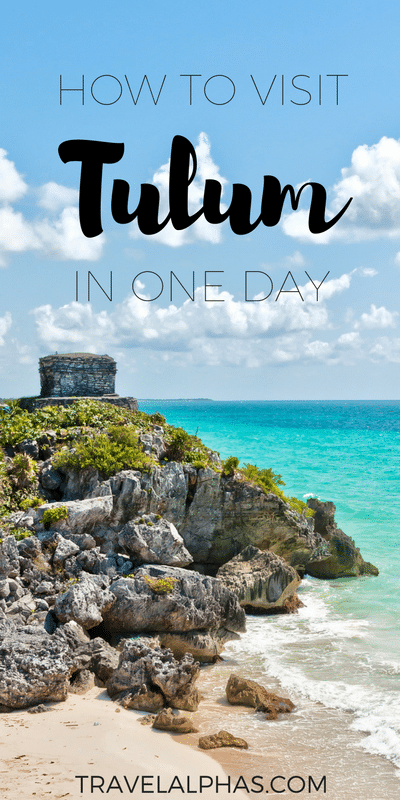 Many travelers don’t ever see this side of Tulum, so we were pretty excited to check it out. After we stopped for a quick photo, our captain and co-captain sailed us out to the reefs to snorkel for about an hour. Like I said before, the snorkeling itself didn’t impress, but we did enjoy ourselves swimming in the warm ocean. If you’re a history buff or a lover of white-sand beaches (who isn’t? 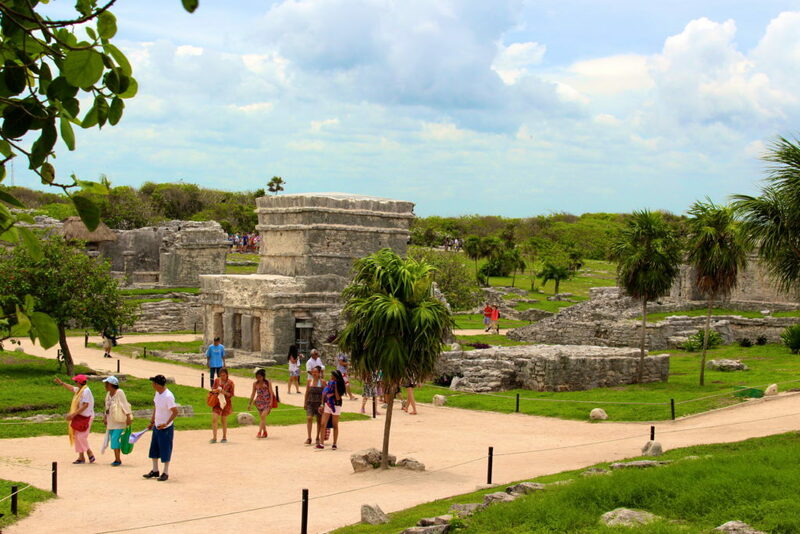 ), a day trip to Tulum from Cancún is the one for you. Think abundant wildlife, lush jungle, ancient Mayan ruins, and insanely beautiful beaches, and then ask yourself how you could possibly skip a day trip to Tulum from Cancun during your next Mexican adventure. I’m glad to hear it! I think that you will love Tulum! Mauricio and I did! I think the seaweed makes the shot look much more interesting . Plus it looks like theres plenty of sand to lay on just behind the seaweed anyway. so no big deal right? I agree with you! Thanks! And yeah, you’re right. There sure was. We went to Tulum yrs ago and it was very nice, is it overrun with tourists nowadays? when we went about 15 years ago there weren’t many others besides our group there. The Colosseum in Rome or the Eiffel Tower are places that I would definitely call “overrun with tourists”. There were plenty of people visiting Tulum, but not so many that it was annoying or overwhelming. I’m planning a trip there soon too! But where do you recommend to be my home base … Cancun or Playa? Probably Playa del Carmen because it’s much more laid back and not as touristy and built up as Cancun is. Love this! The first pic is soooo pretty. Would be so happy to visit Tulum one day! Thank you! You should! It’s a very nice to place to visit for a day trip or to even stay for days at a time!